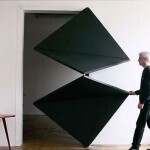 Doors are pretty innocuous, but this incredible design by Austrian artist Klemens Torggler turns the humble fixture into a mind-blowing kinetic sculpture. 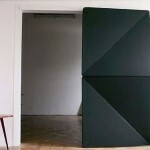 Hit jump to find out more about the design, and to see a full video of the door in action! 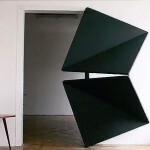 When the Evolution Door is closed, it appears nondescript, but with just a single touch, the door’s four triangular panels split apart and switch positions, gliding across the doorway. During development, Toggler toyed with a system of rods, and an epitrochoid curve, but he found that triangles provided the most streamlined movement and aesthetic.